My plant of the week this time is one of a personal favourite. I have loved the mourning widow geranium for nearly 30 years, not sure what it is about the plant I like so much, whether it’s the foliage or small but perfectly formed flowers, but whatever it is, I think it’s a special little plant. It’s one of those plants that are indeed overall pretty easy to grow. It’s native environment is the wooodlands and low mountainsides of Europe, mainly though the Baltic countries but can be found naturalised in some parts of the uk. It will growin pretty dry soils to dampish, alkaline or acidic again from light sunny spot to one of full shade. It’s one of those plants that is so flexible within the garden. The small flowers are borne in may-June on 2-3ft stems and come in a such a wide range of colours from white to black and many forms of red and blue as well. It’s pretty easy to look after as well. It suffers very few pests and diseases, the worse has to be mildew in a dry summer, cure is easy, you cut the infected foliage back and you are awarded with new fresh foliage a while later, worse is the vine weevil, that will eat the roots just below the surface and kill the plant off. Looking after is pretty easy, I cut them hard back after they have finished flowering, lifting and dividing the plant if required at this time. I tend to feed the beds they are growing in rather than the plant itself. Doesn’t need any staking. Maybe a little bit of water after I have divided them. 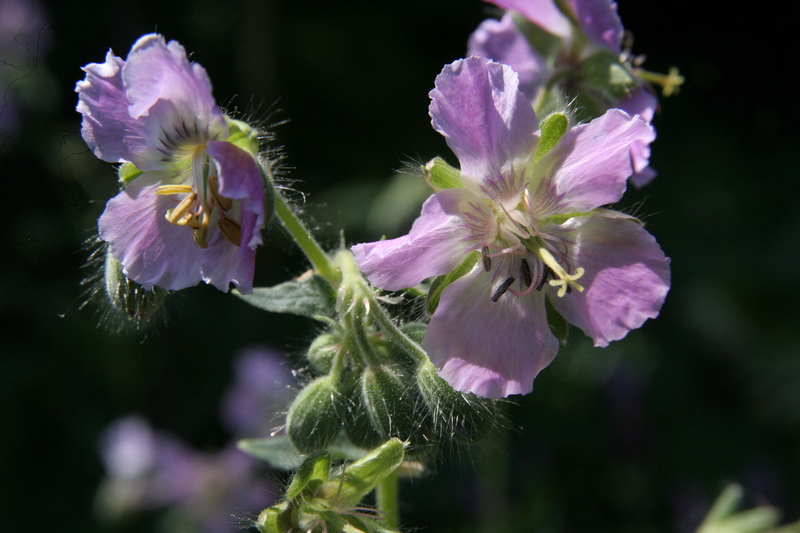 The name geranium comes from the Greek word meaning crane and the seed head looks like a cranes bill while phaeum comes from the Latin for brown after the colour of the flower. Lilly lovell, (left) named by Trevor Bath after his mother.a beautiful form with more of a yellow green foliage, with purple flowers borne above. Joan baker, (right)another famous form would in Bill Bakers garden and named after his wife, the leaves a plain green. Margret Wilson (right). One with striking varagition in the foliage, needs to be kept out of full sun. Can be trying to grow! Previous post: Why a being a gardener, is so frustrating!! I can’t afford your plant of the week any more! Now have an ID on Rose Madder (I’ve been after her for a while but didn’t know her name). Found a nursery with one in stock. Ended up ordering a selection of lovely things. £50 gone from bank account thanks to you! Any chance of plant of the MONTH? Haha sorry I have thought about it but there’s so many beautiful plants around I can can’t help it 😀 pleased to helped put though 😀what did you end up getting? Having finally acquired a Rose Madder (after previously acquiring several near misses) I added a Calamagrostis that looked nice, a few Hordeum jubatum to waft over the edge of the lawn, some red cowslips (makes a change from yellow) and some “different” Ligularia (to put the yellow back!). Oh, and the odd Astrantia may have slipped into the basket before I called a halt. Nursery called Dorset Perennials which I’ll probably be going back to before long. Really good plants.